Community News: August 5 and 6 is the Return of Oakville Jazz Festival! Looking for ways to jazz up your summer days? Then head on to downtown Oakville on August 5 and 6 to attend this year’s Oakville Jazz Festival! 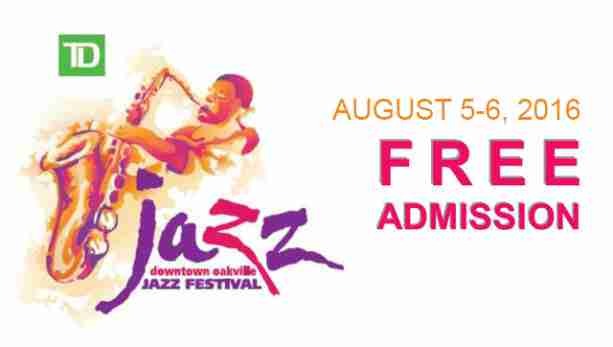 This Friday, August 5 from 5:30 p.m. until midnight and this Saturday, August 6 from 1 p.m. until midnight is Oakville’s free annual jazz festival hosted by the Downtown Oakville Business Improvement Area. There will be 6 stages where performances will be held across Lakeshore Road East Navy to Allan Streets. Both Friday and Saturday will showcase up-and-coming and established artists from all branches and roots of Jazz, including Smooth, Latin, Dixeland, Acid, Ragtime, Blues, Swing, Folk, World Music and more. A floating stage will also be provided by an Oakville-based charity, CharterAbility, a charity that facilitates accessible boating experience for folks with physical limitations or other similar circumstances. According to Ronnie Brown, Committee Chairman of the TD Downtown Oakville Jazz Festival, one boat will hold spectators and another will hold the performers. The boats will then travel along Sixteen Mile Creek after leaving the Oakville Boat Club on Water Street. He added that the jazz festival is a musical event that’s geared for all ages and is family-friendly. Brown has been on the committee for 16 years and has been chairman of the event for 5 years. The TD Downtown Oakville Jazz Festival is now on its 24th year and continues to attract performers and huge crowds. Who wouldn’t want to listen to awesome music as they enjoy the shops and restaurants of downtown Oakville, right? Brown shared that the festival typically pulls in 80,000 to 120,000 people for the two nights that it is on as long as the weather cooperates. Performers to Watch Out For! Headlining on this weekend’s festival are Harrison Kennedy, Hamilton’s Juno award winner on Friday, 10:15 to 11:45 p.m. at the TD Centennial, Steve Hill, Quebec’s Juno award winner on Friday night as well, from 10:15 to 11:45 p.m. at the TD Towne Square Stage, Alex Pangman & Her Alleycats of Mississauga on Saturday 10 to 11:30 p.m. at the TD Centennial Stage, and Cynthia Sayer, acclaimed American banjo player and singer on Saturday 8:30 to 10 p.m. at the TD Towne Square Stage. Brown also shared that festival-goers should keep an eye out for the Trio of Oz featuring Omar Hakim and Rachel Z on Friday night and the Dan Brudeck Quartet on Saturday night. Note that Omar Hakim played his drums with the likes of David Bowie, Weather Report, and Sting. Dan Brudeck is the legendary jazz pianist Dave Brudeck’s son and also a world-class drummer. A few returning artists will be performing as well, including Oakville singers Kathleen Kovacs and Liz Loughrey. Loughrey has been consistently playing at sold out shows across the GTA. Kovacs is a 14 year old performer who made her debut at the festival 2 years ago when she was just 12. She’ll be performing for the festival both Friday and Saturday. Note that parking will be limited at downtown Oakville but festival goers can avail of the free shuttle from Oakville GO Station at 214 Cross Avenue. A bus will depart every 15 minutes. For further details, head on to www.oakvillejazz.com. Love music? Perhaps it is time to move to Oakville! Check out the currently available Oakville homes and contact us for a viewing!